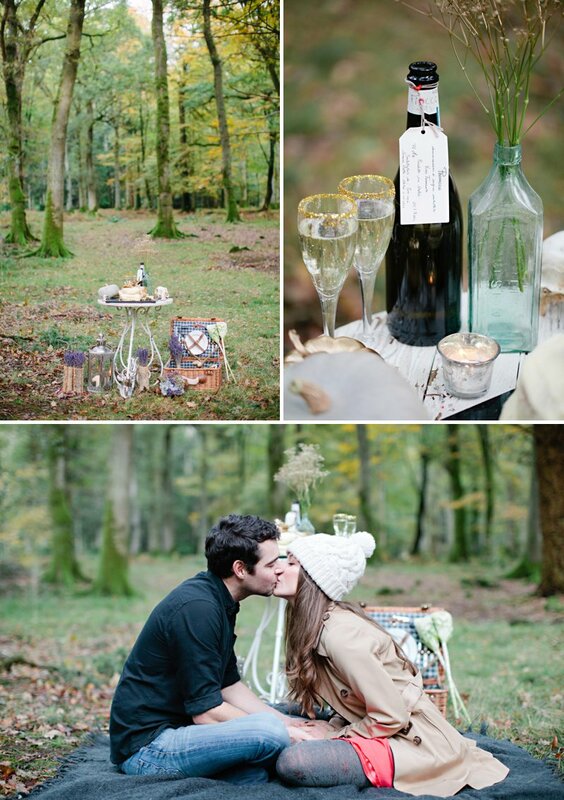 A Prosecco Picnic In The Forest. 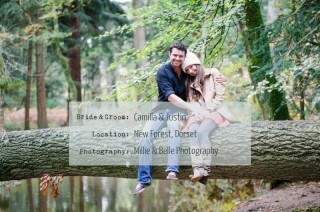 This afternoon we’ve got a lovely engagement shoot for you all to swoon over. 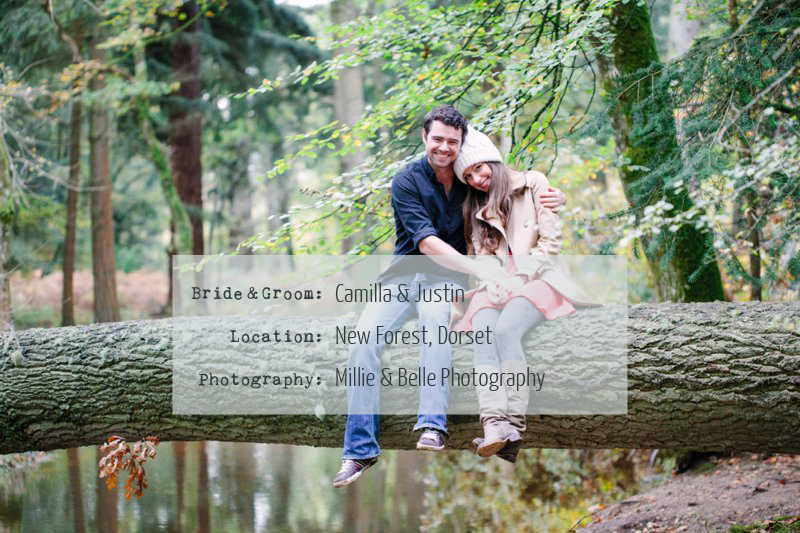 Justin and Camilla’s gorgeous Autumnal engagement shoot took place in the New Forest, which really is a lovely part of the UK. Wild ponies, babbling brooks, sunlit dappled glades – there really is nothing more beautiful than a forest for a natural backdrop. Camilla and Justin are both photographers, so when chosing a photographer for their engagement shoot & wedding, I can imagine there were advantages and disadvantages. Lots of amazing contacts, but having to relinquish control?? Well luckily these two could call on Helen Cawte and Hayley Savage. As well as working individually, Camilla and Helen also form duo Millie & Belle and so the whole shoot basically became a collaborative creative effort. The photos below are a mixture of film and digital as they wanted to see how the two dealt with the colours and faded light in the forest. The film images were then used afterwards as a base for our post processing of the digital files, to replicate the look. I think the overall look is gorgeous – very soft and romantic. Camilla and Justin look like they should be in the pages of a glossy magazine. The beautiful sculptural bouquets, table settings and head piece were made by florists Little Lillies and add the perfect touch of colour and style to proceedings. 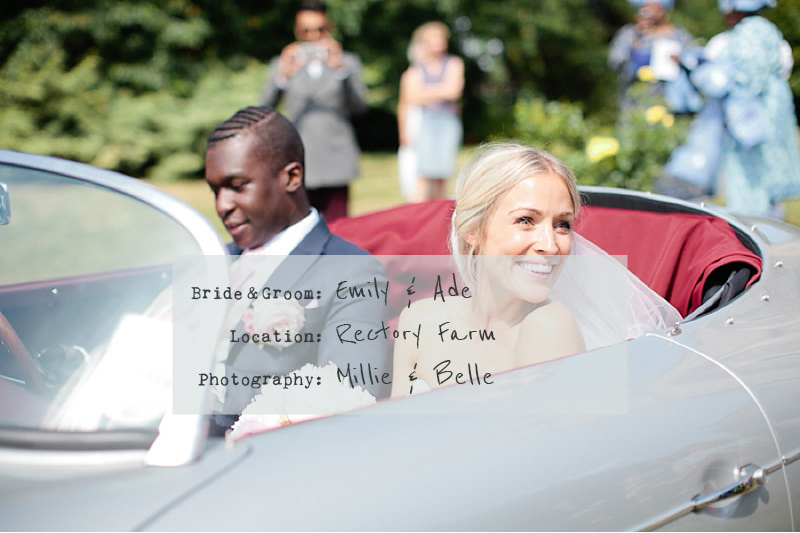 Emily and Adé put some serious effort into organising their wedding. They travelled to France to collect the bubbly, they flew to Vietnam to have outfits custom made for the wedding party, they both changed into traditional Nigerian dress during the reception. Adé even wrote a poem for their ceremony. 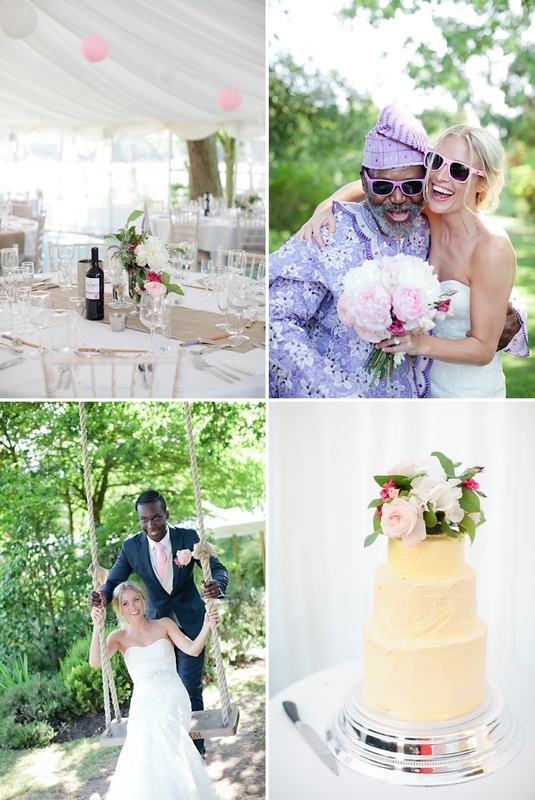 They pulled off an absolutely gorgeous wedding and clearly had loads of fun along the planning journey. And their efforts were sooo worth it, as their guests had loads of fun at the wedding too! Emily The Bride: We chose the local church in the village Emily grew up for the ceremony. The reception was held at Rectory Farm as it was absolutely stunning and had a relaxed feel. We loved that they gave us the freedom to add our own touches and decorate the venue before the wedding. We also loved that the venue had enough bedrooms to accommodate our wedding party who were coming from London. I used an Estee Lauder palette called Surreal Skies to create the natural, shimmery look I wanted. We used our usual scents; mine “Coco Mademoiselle” and Adé “Allure Sport” both by Chanel. I had natural pink Shellac nails that lasted all through the honeymoon too! We used a local freelance hairdresser who created a look that was natural and not too neat. My bridesmaids chose their own hairstyles that suited them best. 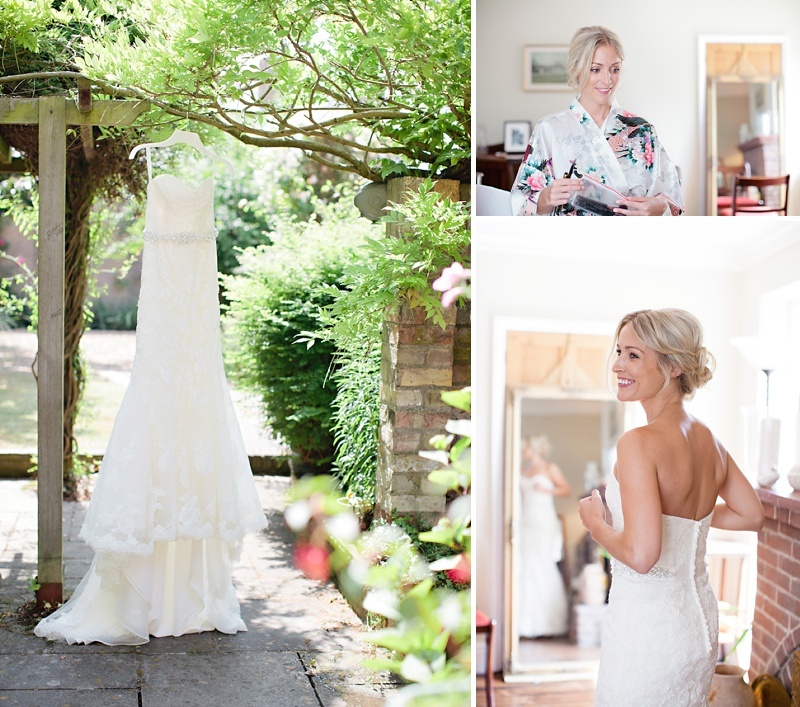 I found my dress in a bridal boutique called Fleur de Lys, in a small town close to Cambridge. My dress was by Benjamin Roberts. I utterly loved the classic style of the dress and thought the different layered lace was so beautiful. I purchased a really pretty embellished belt that I had sewn on so it looked part of the dress. For the evening we changed into traditional Nigerian clothes. I chose the fabric with Adé’s mum and sister, and then we commissioned a local seamstress to make it in the style I had chosen. I wore my sister’s absolutely amazing veil. It was full length, with a thick lace edge. My earrings were from Whistles. Adé and I went to Vietnam in October, and spent 3 days in a small seamstress town called Hoi An. We had 3 piece suits, and shirts made for the best men and ushers and made the bridesmaid dresses in the style of a Tibi dress that I already owned. We had everyone’s name and the wedding date sewn into the clothes. We spent around 5 hours choosing fabrics and bartering on price! The ties and handkerchiefs were made in a similar colour to the bridesmaid dresses. I collected vintage beaded clutch bags as gifts for my bridesmaids. Each design represented their style perfectly and I loved that none of them were exactly the same. Adé and I both picked out some quite quirky multi-coloured socks for the groomsmen and it was a lot of fun deciding who was going to wear which style. I’ve always loved peonies so this was the basis of our colour theme. I had seen lots of pictures of peonies in blue Mason jars and wanted to incorporate this somewhere. I ended up painting my own jam jars with blue glass paint and Adé’s aunties and uncles followed the blue colour for their outfits and head ties. 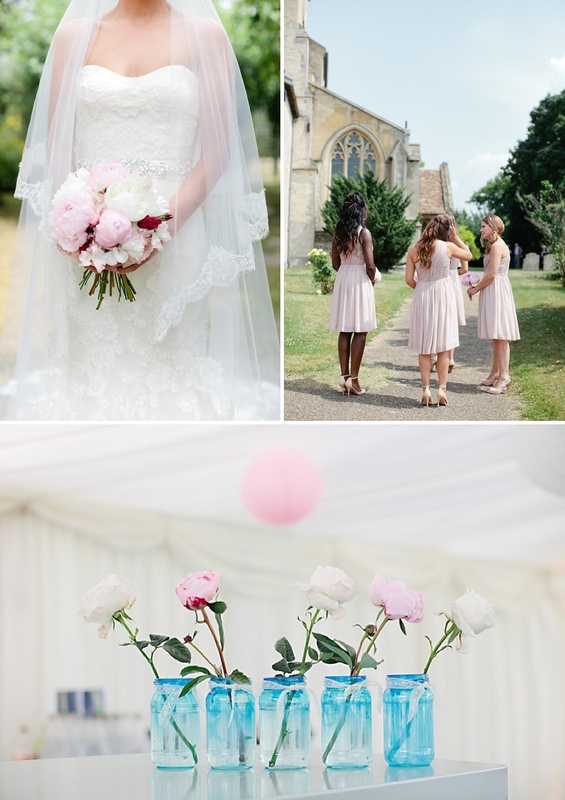 Blush pinks were used for the flowers with flashes of raspberry colours. We looked for the palest pink lanterns we could find and teamed these with various white sized lanterns for the marquee. My bridesmaids helped to put up of the lanterns and we found these great interlocking fairly lights that we attached the lanterns to. My mum made lace bunting for the long walkway leading up to the marque, which really lent itself to the romantic vibe. One of my bridesmaids did an incredible job of making all of the hessian table runners, which worked brilliantly with the flowers. Lots of friends and family collected jam jars and I found some vintage pharmacy bottles, which were wrapped in lace and used for tea-lights and flowers. We used an old whiskey box that we owned as our card box, and I spray-painted the wooden letters in front of box in gold paint. I found lots of my inspiration for flowers from Pinterest. Elizabeth from Mulberry Flowers completely understood what I wanted and created beautiful floral displays. Peonies were the basis of the flowers. My bouquet was a slight cascade of peonies, hydrangas, delphinium pips and raspberry lisianthus. 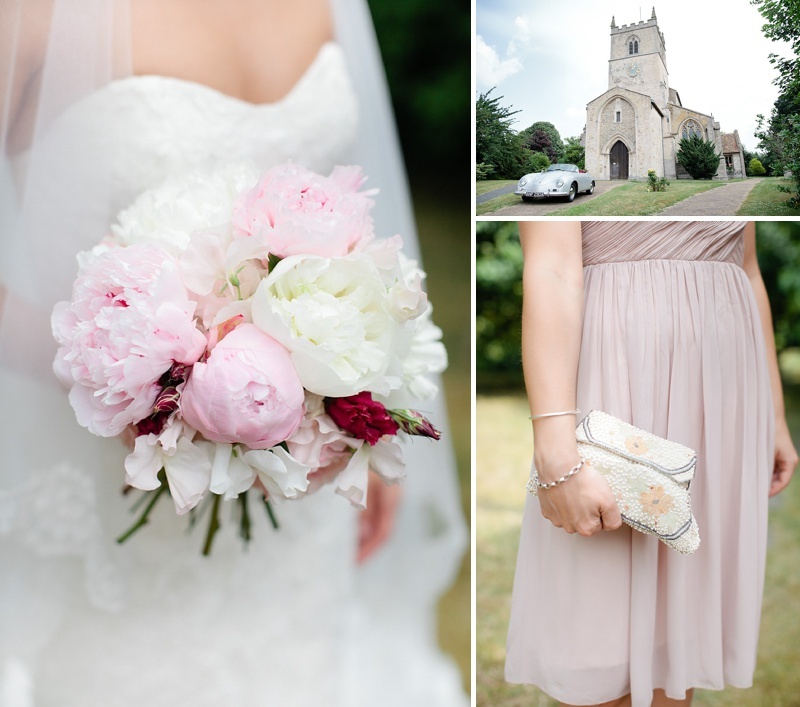 The bridesmaids had a gathered bouquet of blush pink peonies in different shades. For the table decorations I hired mercury glass vases from RVH prop hire. We used a collection of vases in different heights. They were filled with peonies, bells of Ireland, roses, delphinium pips and lisianthus with each one looking slightly different. Mulberry Flowers also supplied us with gypsophilia which Emily’s mum and some friends tied with lace onto the pew ends. She also created two large floral displays in the church, using green foliage from a friend’s garden, pink peonies and ivory lily’s. A retired priest and a family friend married us, which was really lovely. We walked down the aisle to Amy Winehouse, To Know Him Is To Love Him. The lyrics and tone of the song were very overwhelming for both of us! We had three worship songs in the church, How Great Thou Art by Carl G. Boberg and R.J. Hughes, One Thing (Love Never Fails) by Brian Johnson and Everything by Tim Hughes that Emily’s brother-in-law led acoustically. We had two readings, the bible passage Ephesians 5:25-31 read by Adé’s brother and a poem that Adé had written called Together read by one of Adé’s ushers. We could see flashes of their socks as they walked up to the pulpit! When we were signing the register Emily’s brother-in –law Steve sang a version of Elvis Presley, Love Me Tender and Emeli Sande, Next To Me. Steve sounded absolutely incredible in the church and really made it feel like a celebration! We danced out of the church to My Baby Just Cares For Me by Nina Simone. After some mingling and photos we drove off in a 1968 Porsche Speedser 356, which is one of Adés favourite ever cars. During the drinks reception we hired Juma Steel Band They really helped in setting the fun, relaxed feel of the day and fitted in perfectly with the glorious sunshine we had! Our first dance was You and Me by Penny & The Quarters. We love the lyrics and soul tone of this song. Adé took the lead for our first dance; it was intimate and fun, and felt like no one else was in the room! Our friend Cooks DJ’ed in the evening and played some great classics; he literally had everyone dancing all night. Adé and I went to France to pick up the champagne, prosecco and wine we used for the wedding. The Cambridge Dining Company provided the delicious food on the day. Our canapés were duck parcels, cucumber cups and mozzarella roulades which were accompanied with fresh lemonade and free flow prosecco and raspberries. The Cambridge Dining Company supplied us with a gorgeous BBQ that included a selection of meats and fresh salads. We had champagne for the toasts and we chose someone from each table to serve it. Just before the speeches Adé asked everyone to look under their chair for an apron and then put it on. They then followed him to the bar to collect the champagne and posed for a few photos. It was so amazing to see our friends and family enjoying themselves so much and really getting into the spirit of the day! We had a sweet table that included some Nigerian biscuits, Chin Chin which we both absolutely love! We used vintage whiskey decanters on the sweet table that were filled with flowers. Our favours were painted chopsticks that we had bought from Vietnam. When tied with Kraft tags they also acted as place names, which Emily had stamped with ‘To have and to hold’. We also supplied flip-flops as ‘A treat for your dancing feet!’ and provided the ladies with a collection of cosmetics in the bathroom. We had different coloured sunglasses that were used ‘To protect everyone from our love!’ which were great on such a sunny day. We had commissioned a family member of a friend in Singapore to design the wedding stationery. She completely understood the look we wanted and created something really classic and elegant. Emily collected vintage glass candlesticks that we used to hold up the table numbers with a cork and a paperclip. We used a wooden clotheshorse for our table chart, with the names written on different kraft tags. The kraft tags and bakers twine was bought from Etsy. We used blackboard paint and chalkboard pens to write messages on old frames. Helen and Camilla were unbelievable on the day and during the build-up. They were wonderful at making everyone feel at ease and it really came through in the photographs, as they are just so natural. They were really unobtrusive but still captured all the intimate moments. The light in the photographs is really incredible. We honestly don’t think the photographs could better capture the day, when we first viewed them we felt like we had lived it all over again. Enjoy every second of the day, have fun and relax! Take your time walking down the aisle so you can take in that incredible moment! See – how happy does everyone look?? 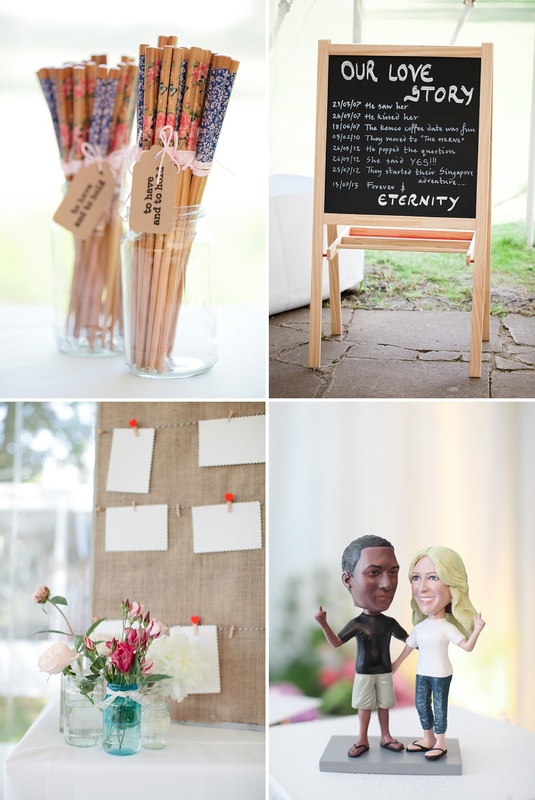 The table plan is v original too – and easy to recreate for not too many pennies. You know how much we all love a swing at a wedding too!